The Resolution also recognizes rural populations, workers and indigenous peoples’ contribution to sustainable development and biodiversity. 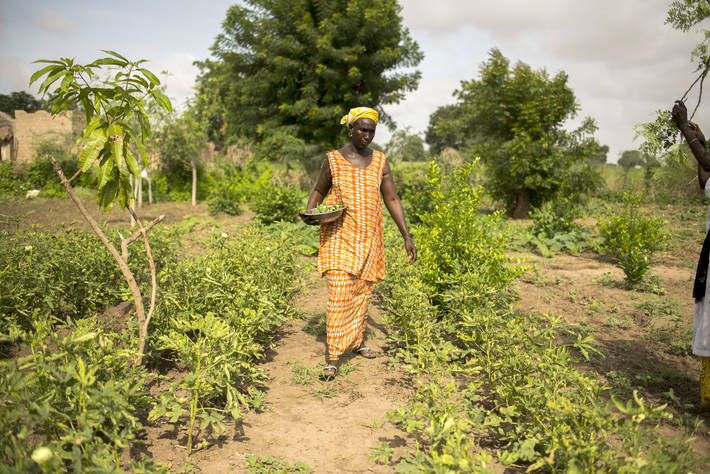 A woman farmer in Senegal. | Photo from FAO. New York/Rome (FAO)* – FAO has hailed a landmark United Nations General Assembly resolution adopting the Declaration on the Rights of Peasants and Other People Working in Rural Areas. “FAO welcomes the adoption of the declaration. Rural people have been consistently left behind – they make up the vast majority of the world’s poor, generally have lower wages and less access to water, energy, social protection and other services that are essential for their sustainable development. This is an opportunity to change this reality,” said Carla Mucavi, Director of the FAO Liaison Office to the United Nations in New York. Specific rights recognized by the Declaration include the right to adequate food, land and water. The Declaration also upholds the need to respect the cultural identity and traditional knowledge of rural people as well as the need to provide social protection and to ensure gender equality in rural areas. The adoption of the Declaration is the culmination of an inclusive negotiation process that lasted six years led by Bolivia. FAO has supported the process to adopt the Declaration, which is linked to most of the principles and guidelines adopted by the Committee on World Food Security and various FAO bodies. In particular, the Declaration makes reference to the Voluntary Guidelines on the Responsible Governance of Tenure of Land, Fisheries and Forests in the Context of National Food Security and other global conventions such as the International Treaty on Plant Genetic Resources for Food and Agriculture. The themes and values underpinning the Declaration also relate to other aspects of FAO’s work including with indigenous peoples. Mounting evidence shows that people in rural areas suffer disproportionately from hunger and poverty. Globally, the poverty rate in rural areas is more than three times higher than in urban areas, and rural areas account for over half of the world’s population and 79 per cent of the total poor, according to a recent World Bank report. Seventy percent of the two billion people in the world without basic sanitation services live in rural areas and the access rate to energy in rural areas is of approximately 75 percent compared to 96 percent in urban areas. According to the Report of the Special Rapporteur on Right to Food presented to the seventy-third session of the General Assembly, only about twenty per cent of agricultural workers have access to basic social protection and their wages are generally low, paid late and not periodically adjusted. The Declaration is also expected to have a positive impact on the livelihoods of family farmers, who produce over 70 per cent of the world’s food-and over 80 per cent in developing countries-in terms of value. FAO is providing knowledge and resources to member countries in support of the UN Decade of Action on Nutrition and the UN Decade of Family Farming, both of which stress the centrality of peasants, small-scale fishers and pastoralists in achieving sustainable food systems that provide healthy diets for all.